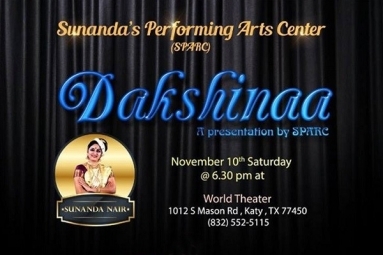 You are invited to spend an evening immersed in the classical Indian dance form of Mohiniattam with renowned live musical accompaniment. Dr. Sunanda Nair is one of the leading Mohiniattam exponents in the country today with her valuable contribution of 35 years of performing and teaching this art form. She is a name to reckon with in the field of Indian classical dance, as a highly acclaimed performer, choreographer and teacher in the international classical dance arena. Her students will be presenting select pieces of her repertoire that will be certain to thrill audience members both young and young at heart! With over 35 years of teaching both in India and USA the performances of her students are commendable and well appreciated. Not only are her students highly recommended and applauded for their pristine and amazing performances, they have won awards, prizes and accolades for the same all throughout the USA as well as on various international stages. Several of her most seasoned students will showcase their talent as part of this special evening.